Distinguished Concerts International New York City (DCINY) announced today that director John Benton and the McDougle Middle School Choirs have been invited to participate in a performance of The Music of Alberto Grau on the DCINY Concert Series in New York City. This performance is planned to take place on Sunday, June 23, 2019 in Isaac Stern Auditorium at Carnegie Hall under the baton of Maestra María Guinand. These outstanding musicians will join with other choristers to form the Distinguished Concerts Singers International, a choir of distinction. Alberto Grau will be present as Composer-in-Residence. Maestra Guinand will lead the performance and serve as the clinician for the residency. Dr. Jonathan Griffith, Artistic Director and Principal Conductor for DCINY states: “The McDougle Middle School Choirs received this invitation because of the quality and high level of musicianship demonstrated by the singers as well as the quality of their audition recording. The singers will spend 5 days and 4 nights in New York City in preparation for their concert.“The singers will spend approximately 9-10 hours in rehearsals over the 5 day residency,” says Griffith. “Not all of the time is spent in rehearsals, since there is so much history and culture to see in New York City. 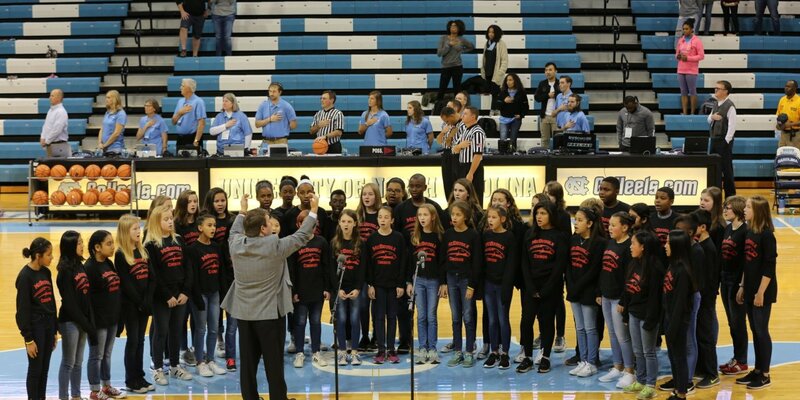 However, the performance is the primary purpose for their visit to the city.” Members of the community are encouraged to give financial support in sending these singers to New York by contacting John Benton at jbenton@chccs.k12.nc.us. Distinguished composer, conductor, and teacher Alberto Grau (b. 1937) has earned a place of honor among the best contemporary Venezuelan musicians. Alberto Grau is best known for his work as a choral conductor, but as a composer he has become one of the leading figures in Latin America and many of his works have been published by Earthsongs (USA), N.J.Kjos (USA), A Coeur Joie (France), Oxford University Press (England), GGM editors (Venezuela) and receives permanently many commissions from choirs all over the world. His books on Choral Conducting and Composition The making of a conductor and The making of the composer are references for young conductors and musicians. festivals with his choirs such as ACDA Conventions, World Choral Symposia, Europa and America Cantat Festivals. Also he has been invited as a guest conductor, adjudicator, and professor of choral music in Europe, USA, Latin America, and Asia. The International Federation for Choral Music gave him in 2015 the ‘Life Long Achievement Award’ for his work as a composer and pedagogue. More than thirty recordings provide evidence of his fine musicianship and extensive knowledge of international and Latin-American choral repertoire. He is the honorary and founder director of Schola Cantorum de Venezuela, the Orfeón Universitario Simón Bolívar, and the Ave Fenix Choir, and is a member of the Directive Board of the Fundacion del Estado para las Orquestas Infantiles y Juveniles de Venezuela, FESNOJIV. Currently he is artistic advisor and composer in residency of the Progam Pequeños Cantores de la Schola and of the Project of Social Action for Music of CAF. For more than 30 years he was professor of Choral Conducting in several institutions, such as the Musical Institute and the University Simón Bolívar in Caracas and Director of the Choral Symphonic productions of FESNOJIV. He has studied with Venezuela’s most gifted teachers: Vicente Emilio Sojo, Angel Sauce, Juan Bautista Plaza and Gonzalo Castellanos. the 6th World Choral Symposium in Minneapolis in 2002. Maria Guinand is the Artistic Director of Schola Cantorum of Venezuela and conducts choral projects throughout Latin America, Europe, the United States, and Asia. Renowned as an authentic interpreter and trainer of Latin American choral music of the 20th and 21st centuries, she is a recipient of the Helmuth Rilling Preis (2009), the Robert Edler Preis für Chormusik (2000), and the Kulturpreis of the InterNationes Foundation (1998), three of the most distinguished prizes in choral music conducting. A graduate of Bristol University in England, she studied choral conducting with Alberto Grau, and went onto further studies in conducting and musical education with Helmuth Rilling, Luigi Agustoni, and Johannes B. Goeschl. Currently, she conducts two of Venezuela’s most prestigious choirs, the Schola Cantorum de Venezuela and the Cantoría Alberto Grau, with both of whom she has toured extensively and won many awards. Always interested in new choral music, she has been involved in projects such as the premieres, performances, and recordings of Osvaldo Golijov’s La Pasión según San Marcos and John Adams’ A Flowering Tree. For over three decades, María Guinand has been the Associate Conductor and Advisor of Choral Symphonic Performances and Activities for El Sistema (FESNOJIV), the world-renowned music program in Venezuela. She teaches in the Master Degree Program for Choral Conductors at the University Simón Bolívar, where she has been a professor and conductor for 28 years. As a choral promoter and Director of the Schola Cantorum of Venezuela Foundation, she contributes to the permanent establishment of choral music centers for children and youths of disadvantaged backgrounds in Venezuela and other Andean countries. As conductor of the Polar Foundation Choir she has actively contributed to the development of choral music in private enterprises. She served for twelve years as the Latin American Vice President of the International Federation for Choral Music. She is also editor of the “Música de Latinoamérica” collection at Earthsongs, music editorial house. Founded by Iris Derke and Jonathan Griffith, Distinguished Concerts International New York (DCINY) is the leading producer of dynamically charged musical excellence. With its unforgettable concert experiences in renowned venues, empowering educational programs, and its global community of artists and audiences, DCINY changes lives through the power of performance. Tickets For more information on tickets, group sales or other special offers, please contact us at 212-707-8566 Ext. 307, or BoxOffice@DCINY.org. To acquire high-resolution images of DCINY performances at Carnegie Hall and Lincoln Center for media use, interviews, and press requests, please contact Press@DCINY.org.